While perhaps far from mainstream science, biological surfaces have received a lot of attention in recent decades, especially by the biomimetic community. In fact, many studies surrounding surfaces have become the prime examples of Bionics/Biomimetics, such as the self-cleaning lotus leaves, the super adhesive gecko pads, etc. In this post, I will be focusing on the sandfish (Scincus scincus), which has become known for its “almost frictionless” and “anti-abrasive” skin. Scincus scincus is, obviously, a member of the skink family (Scincidae) , and inhabits the sandy deserts of Northern Africa and the Middle East [2, 3]. Its streamlined body and undulatory movement allow it to move in loose sand, resembling that of a fish – hence its common name . Being constantly exposed to the rough sand, one should assume very frequent moulting (shedding) due to damage to the epidermis. However, the skin turns out to be extraordinarily resilient to abrasion by the coarse sand particles and even once shed, remains intact for quite some time [3, 4]. The first in-depth studies of this effect were performed by Rechenberg & Khyari (2004), which quantified the friction and abrasion between sand and epidermis and analysed the surface topography. Interestingly, sandfish skin showed very low friction angles towards sand – approximately 20° – when compared to other materials. Additionally, comb-like microstructures were discovered, which are transversally aligned along the scales, with the ‚teeth‘ facing the posterior end of the body. Interesting surface effects are often synonymous with micro and nanoscale structures, thus, naturally the found structures were assumed to be responsible for friction and abrasion reduction. 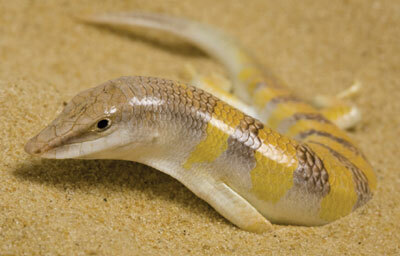 Also, other sand-swimming reptiles were also shown to have such microstructures, supporting this idea. Synthetic surfaces resembling the sandfish epidermis were fabricated and indeed showed a slight friction reduction when compared to untreated smooth surfaces . With new data, however, the microstructure hypothesis was challenged as being the only reason for the friction reduction. For one, the sandfish’s body is not necessarily uniformly covered with such microstructures (for example, they are absent on the ventral side [3, 6, 7]), but does uniformly show low abrasion and friction angles towards sand. Also, a close relative of the Sandfish – the Berber skink (Eumeces schneiderii) has been shown to have the same microstructures, but shows significantly higher friction angles [3, 6]. Fig. 2: A comparison of sand swimming reptiles and their skin. The sandfish Scincus scincus (left), the wedge-snouted skink Sphenops sp. (middle) and the sand boa Eryx sp. (right). The upper row shows the animals and the lower row shows their scales under the light microscope and SEM . Fig. 3: A comparison of ventral (bottom) and dorsal (top) scales of four species under SEM. Scales of S. scincus, E. schneiderii, Scincopus fasciatus and Meroles anchietae are compared [6,7]. Thus, further research of the sandfish skin has been initiated, investigating the epidermal ultrastructure and biochemical composition. From a structural point of view, the epidermis of S. scincus is constructed by the same general blueprint as in other lizards, or even tetrapods in general for that matter. From the innermost (basal) to the outermost (apikal) part, the epidermis is composed from: alive keratinocytes which multiply and produce keratin, are then slowly pushed upwards, become compacted and flat before they die and leave a more-or-less, homogenous layer of fibrous keratin . Keratins are structural proteins which give the epidermis, as well as other skin formations, such as hair, claws, hooves, etc. their chemical and mechanical properties [8, 9]. In lizards, we often see an additional lipid layer and typically separate keratin layers, which are distinguished into the α layers and β layers . Analytical methods, SDS-PAGE and Western blots, have shown that both α and β keratins are present in the Sandfish skin , however, the surprising finding was that these also contain glycans — oligosaccharides, which are linked to proteins during synthesis in the endoplasmatic reticulum and the golgi apparatus [3, 6, 10, 11]. Keratins are rarely found to contain such modifications, thus, they were given more attention. When isolated from shed sandfish skin and covalently linked to artificial materials, such as glass or acrylics, the friction angles of these materials were significantly reduced [6, 12]. Fig. 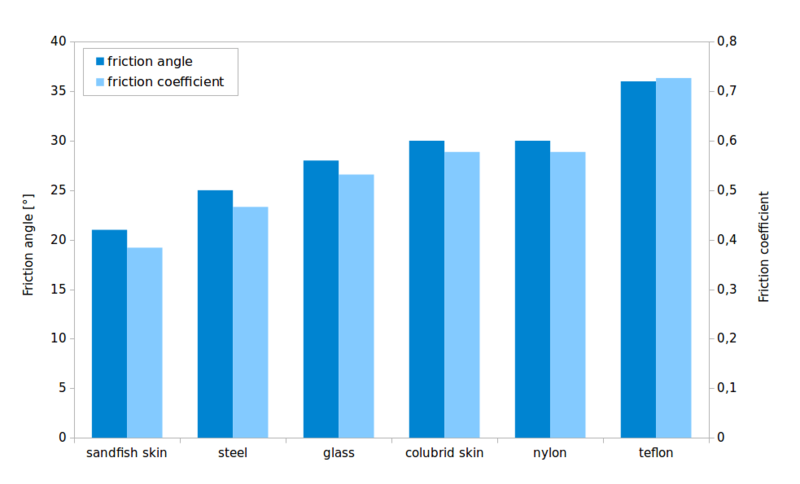 4: Friction comparison of modified and untreated lacquer plates. 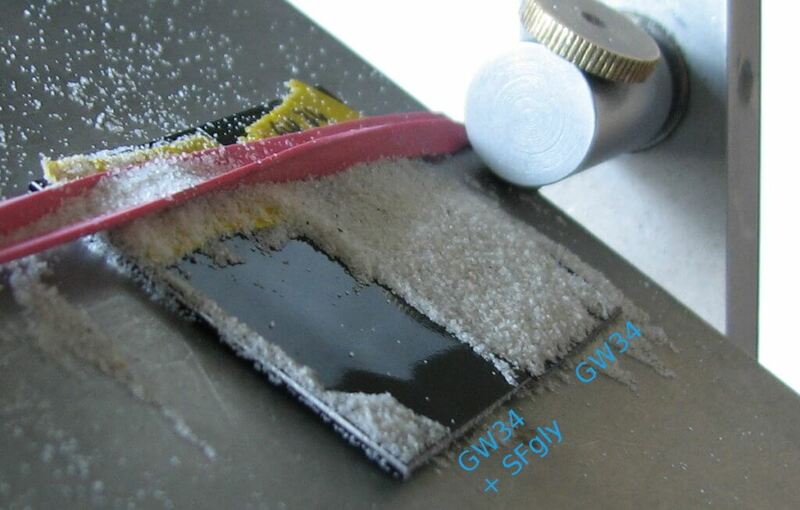 A treated and an untreated sample were placed side by side, covered with sand and the inclination was increased until the sand began to slide off . Mass spectrometry of the purified glycans showed structures high in Mannose, which are typically branched [11, 12]. It is still unclear whether all these are present in the native keratins, or are actually residues of larger structures that were broken down during purification . Whatever the case, these purified structures seem to be capable of reducing the adhesion between a modified surface and sand. On a molecular level, the reasons for this are still open for speculation, but it will likely be something to do with van der Waals forces [6, 12]. 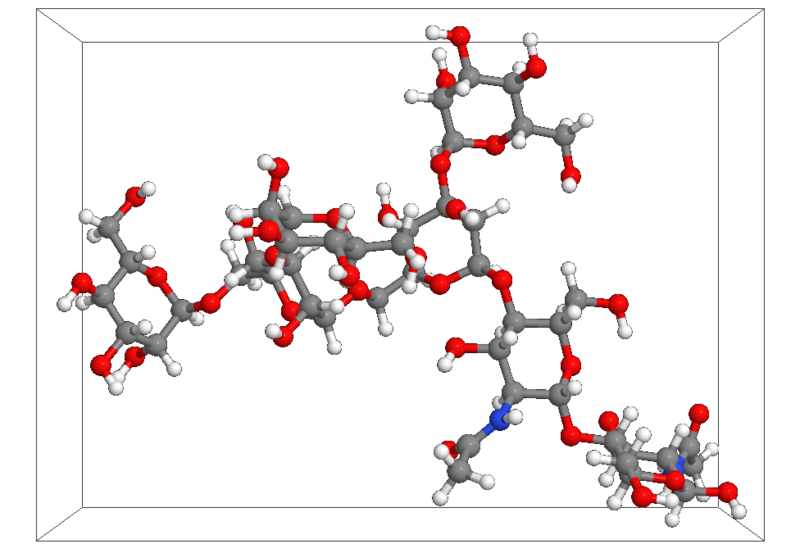 Currently the branched spatial structure of the glycans is considered as a possible answer. By reducing the absolute atom density in the upper layers of the skin, these oligohydrates could possibly reduce the overall number of possible interactions with close objects – thus functioning as some kind of molecular spacers . While the concept seems possible from current data, it remains to be verified. In addition, there are still many unknowns, such as the number and location of the glycans on the keratins, the atomic structure of the sandfish epidermis, etc. Also, adhesion and friction reduction does not completely explain abrasion resistance, as for this we also need to consider mechanical properties. The sandfish skin has been on the radar of biomimeticists for almost two decades and many discoveries have been made to describe its properties. However, there are still many more to follow. Exploring… WOOD. Our new theme session. Boštjan Vihar is a Biomimmeticist with a PhD in Biology from RWTH Aachen University. He is interested in the structure and properties of living things and how these interact to create function. He believes that understanding the underlying principles of life and transferring them to new technology holds great potential for a more efficient and sustainable society. As an undergraduate he focused on studying Animal Physiology and later Neurobiology and Bionics/biomimmetics. While doing research at the Institute for Cellular and Neurobionics in Aachen his interest shifted towards biological surfaces, their interaction with the environment and replication. 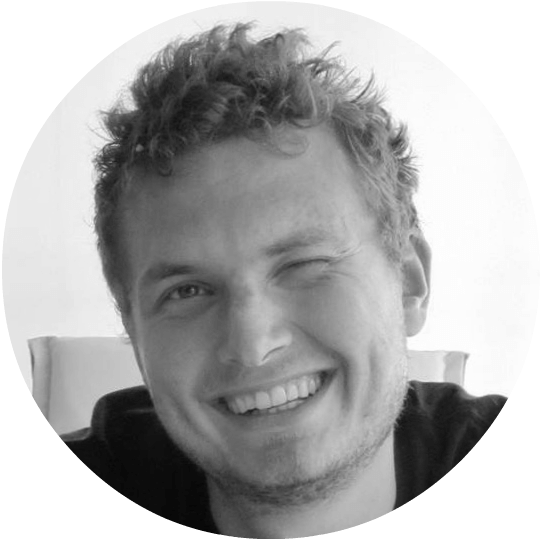 In 2012, he began collaborating with the Graduate school for Bionics: Bonn - Aachen - Jűlich and in 2014 he was also active as a research assistant at the Institute for Biomedical Mechatronics, JKU Linz. At IRNAS, he is building an open laboratory for biological and biomedical research, using low cost and DIY equipment, optimized for high-end research, with the goal of making it more accessible to the general public.